I love this picture. I took it of my youngest daughter, Lola, as she watched her older sister compete in a school track meet. She was complaining of being too hot and went to the car to see what she could find. Forgetting, I had hidden these very special hand-me-down tutus for her from a dear friend in the trunk, I said, “sure go ahead and see what you can find.” As she dug through the trunk..her eyes darted straight to the bag of tutus the same time as mine. Before I could distract her…she said, “what are these? !” with her eyes as big as saucers. Darn, I thought, the surprise was now ruined. Or was it? 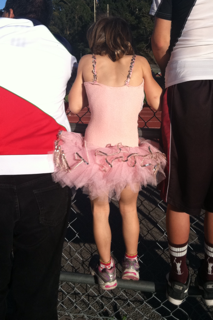 Without hesitiation, she ripped off her other clothes and jumped right into this pink tutu with sequins and all. I had to go with it. 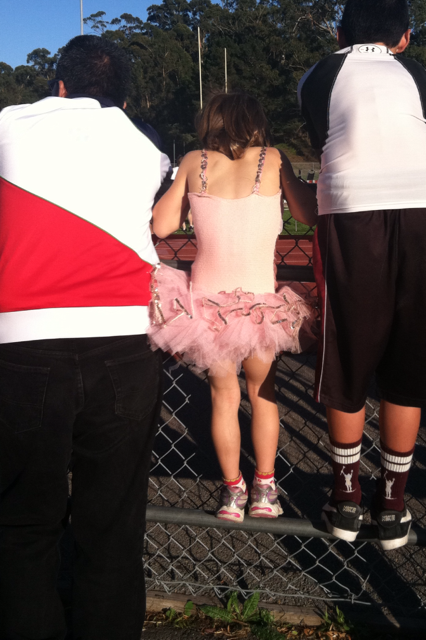 I figured if she was confident enough to walk around a track meet in just her tutu and running shoes, then far be it for me to list my reasons why she may not want to wear that….“are you sure honey, might get kinda of itchy in the heat?” “do, you really want to wear that…now?” Of course she did! So, off she went watching the rest of the meet in her new comforatble and cool clothes. As you can imagine, when my teenage daughter saw her sister in all of her glory watching from the fence…she rolled her eyes and ran the other way....teenagers, what do they know? As I looked at the picture, I realized my planned surprise was not ruined at all. It became a gift. A gift to to see my confident and strong-minded daughter in action with not a care in the world, especially about what other people think. I also get to see myself..growing up as a dancer and now a runner and the huge impact they have had on who I am today. Other than my family, my tutus and running shoes have been the most important things in my life. Thank you Lola for showing me the way and reminding me about what’s really important. That is the best gift of all.